Racing driver Christian Bakkerud has died after his silver Audi A6 overturned on the A3 at the Tibbets Corner Roundabout, near Wimbledon Parkside. Police who were alerted by London Ambulance Service at 6.05am on Saturday (September 10) do not think another vehicle was involved. London-based Mr Bakkerud (left), aged 26, was taken to a south London hospital suffering serious head injuries. But he died the following day. 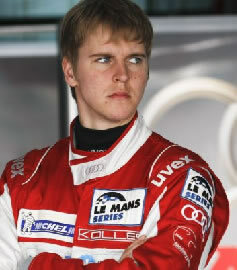 The Danish-born driver had not raced this year, and had been hindered by a recurrent back injury. His last major start at the 2010 Le Mans 24 hours with the Kolles Audi team. He has raced in Formula BMW, British Formula 3 and GP2 between 2002-2008. He was a podium finisher in Formula BMW in Germany and the UK, and his career highlight was a British F3 win for Carlin at Mugello in 2006. Officers from Hampton Traffic Garage are investigating. Any witnesses, or anyone with information, is asked to call police on 020 8941 9011.